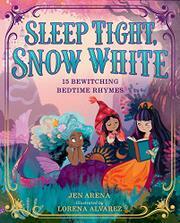 Fairy-tale and nursery-rhyme characters help young children go to sleep in this beautiful bedtime book. In simple rhyming verse Arena bids good night to a host of well-known characters: “Sleep tight, / Snow White. / Seven dwarves / say good night”; “Rest your head, / Little Red. / Forget the Wolf. / It’s time for bed.” Some of the rhymes have a slight tongue-in-cheek bent, as in: “Don’t rough it, / Little Miss Muffet. / Fluff a pillow— / chuck the tuffet!” And one rhyme may raise the eyebrows of feminist readers: “Want a fella, / Cinderella? / Eight hours’ sleep / will make you bella.” In all, 15 different characters make an appearance; most are female except for Prince Charming, Little Boy Blue, who make solo appearances, and Hansel, Jack, and Beast, who appear with Gretel, Jill, and Beauty, respectively. Each character or character duo is given a full two-page spread, illustrated in a gloriously exuberant style with an equally vibrant palette by Alvarez. The characters each sport different hair and skin colors in a range of hues. If little ones are not yet familiar with the fairy tales and nursery rhymes alluded to, use this as an excuse to introduce them to what could be called a cultural common language. Pair this with Janet and Allan Ahlberg’s classic Each Peach Pear Plum (1978) for a multiracial update.